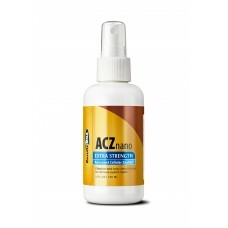 Replacing the original formula, ACZ nano? Extra Strength provides the highest concentration of nanomized clinoptilolite zeolite per dose resulting in far greater detoxification and extraordinary results. ACZ nano? Extra Strength works instantly, detoxifying the blood, cells, and balancing the pH levels in the body and effectively reverses acute chemical and allergic reactions. ACZ nano? Extra Strength is the only detoxification product formulated to remove fluorine and chlorine, two of the strongest oxidizing agents known and found in most drinking water. ACZ nano? Extra Strength has been shown to increase urinary output of Mercury up to 103,500% over baseline during only 12 hours of post-provocation urine collection. ACZ nano? Extra Strength is the only nanomized zeolite formula available with over 90% of total zeolite crystals existing within the nano range as calculated via SEM analysis. Competing liquid and powdered zeolite formulations utilize micronized zeolite, with particles over one thousand times larger than the nanomized zeolite crystals provided in ACZ nano? Extra Strength. ACZ nano? Extra Strength selectively and irreversibly binds and removes toxic heavy metals, chemical toxins, VOC?s, radioactive toxins and free radicals of all types through the urinary tract, without removing vital nutrients. These results have been verified in multiple, independent urine challenge studies. Urinary toxin output is significantly increased because nanomized zeolite particles are readily absorbed into the bloodstream, providing systemic reduction of body burden. Most oral chelating agents such as EDTA and micronized zeolites, exhibit poor absorption and remain in the gut. ACZ nano? Extra Strength provides approximately 1,000 nanomized zeolite particles for every single micronized zeolite particle provided in competing zeolite products. An unparalleled adsorbent, ACZ nano? Extra Strength provides a one million times increase in the actual surface area per equal amounts of zeolite administered, thus delivering proven and far superior results. Patient response is very positive and readily discernable. Physicians who prescribe ACZ nano? Extra Strength do so repeatedly as an effective adjunct to their healing protocols. ACZ nano? Extra Strength is significantly more effective in the systemic removal of toxins than competing brands.